The ECD Hazardous Location Transmitters - Model X80 Series provides the same capabilities and general feature set as the general purpose T80 Universal Transmitter. Various configurations are available as single or dual channel for the continuous measurement of pH, ORP, pION, Dissolved Oxygen, Turbidity, Conductivity or Resistivity. 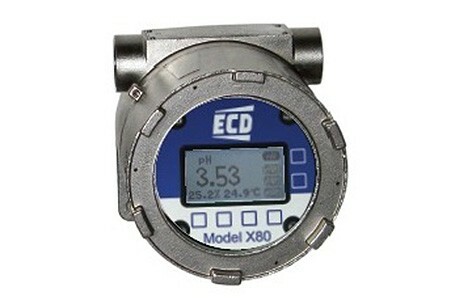 The Model X80 transmitter digitally communicates with any ECD Model S88 and/or S80 Intelligent Sensor, automatically configuring the transmitter's menus and display screens to the measured parameter. The X80 is designed with a durable stainless steel enclosure for explosion proof/exd hazardous applications.